Are you holding on to a property in Weatherford and you aren’t exactly sure why? Selling your house can be a large task. When hiring an agent, the process will likely take much longer than a direct sale, and can also end up costing you more in the long run! Keep reading to learn how long will selling your house in Weatherford take and the time it takes to sell will affect you financially. While there is no way to determine how long selling your house will actually take when listing your house with a Weatherford agent, you can plan ahead if you choose to sell directly. In our latest post, we will look at how long selling your house could take and the common things that can cause delays. 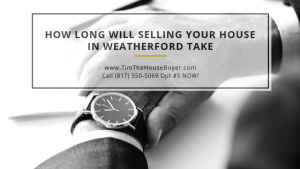 How Long Will Selling Your House In Weatherford Take? Maybe you’ve been on the fence about selling your house. You are wondering if it’s the right time. Life happens for many reasons causing you to sell your house fast for cash. If you decide to list your Weatherford house, you will likely need some time to get it ready for the market. You’ll want to clean up, remove personal belongings, make repairs and possibly stage the house for showings. Before anything else, let us first say that there are some truly great agents out there. Choosing an agent can take some time as well. You aren’t going to want to work with the first agent you meet. Instead, you will likely do some research, talk to friends and family who have recently sold, and speak with a few agents before deciding who to hire. However, selling with one isn’t always the best way to sell a house. Every house is unique as is every situation sellers are facing. Before you decide to list your house, consider all of the ways you can sell your Weatherford house, and then. When you sell to a direct buyer such as Tim The House Buyer, you will know exactly what you are getting and on what day. There are no lenders or red-tape. We are able to pay you in days, not weeks or months. By selling directly, you will not have to live in limbo. You will be able to move on with your life quickly and easily. Be sure to watch this short video below I created for you on how we can help you sell your house fast in Weatherford and nearby cities. When you sell directly to Tim The House Buyer, you will get an offer right away. It is then up to you to decide if it is the right choice for you. We understand you might need some time to think about it or run the numbers. We will never pressure you into a sale. If you choose to accept our offer, the closing can take place in a matter of days. With a direct sale to Tim The House Buyer, you will avoid all costs of listing (repairs, commissions, closing costs, etc.) and be able to plan ahead by knowing exactly when the house will close so you’re done with it. For many properties in Weatherford, a direct sale is a faster and more cost-effective solution. You will not need to make repairs or hire an agent in order to sell. Before you decide to list, find out if a direct sale is right for you! There is never any commitment! We here at TMC Property Solutions offer cash for houses in Weatherford and the surrounding area. We’re local house buyers helping local homeowners sell their house quickly and have been buying houses since the year 2000 with no closing costs, no commissions, no hassles to you. Simple, quick and cash in your pocket. We do a variety of things with our homes from holding them as rental investment property for ourselves to remodeling them and flipping them for someone else who would love to live there and enjoy the home themselves, and some we wholesale to other investors to fix-n-flip. The benefits of selling directly are numerous! For many people, it is the simple, stress-free way of selling their house they have been looking for! We encourage you to run the numbers to find out if it makes sense for you!